The person is coming close to the company and gets a notification to look to see more about how well the account is doing (Account Health.) I (as this sales person) sign-in and I find out that from service cloud, that this is not a “healthy” customer, so I can’t talk to them about adding services or products. I’m walking into a situation where there is an issue that has not been resolved. If I did log on and see there weren’t any issues, I might be able to start the conversation about what they might buy. Instead, I’d start by solving the unresolved issue. I can also see the opportunity for what they might buy if I can solve their issue. Customer Service Is Mission Critical: This makes so much sense and why customer service needs to be a mission critical part of the overall business strategy. It is the canary in the coal mine. Everything you need to know about what your customers think and feel about your products and services can be found in customer service. It always has been. It’s only recently, by connecting marketing, sales, service, that we can actually use that information to make better business decisions. I like this a lot. It’s something I’ve been on a soapbox for years. I thank the cloud for bringing all these applications together so that we can have this integrated view of our companies. Customer Success Management: What some of the conversation today reminds me of customer success management. I have written about this in separate reports for vendors that specialize in looking at how well an application has been deployed, used, by whom and for what. It seems this idea has been translated into the Platform as a Service by Oracle, to be able to know more about my customers and determine if they are happy and if not, and what I, as for example a salesperson, can do. It only makes sense. If you have the data, why not use it to know if your customer is happy? No customers, no business. It’s really that simple. This capability may not be as developed as the customer success management vendors, but it’s definitely in the right direction. Customer Experience: Certainly it’s gotten more difficult to manage devices and channels and predict customer behavior. 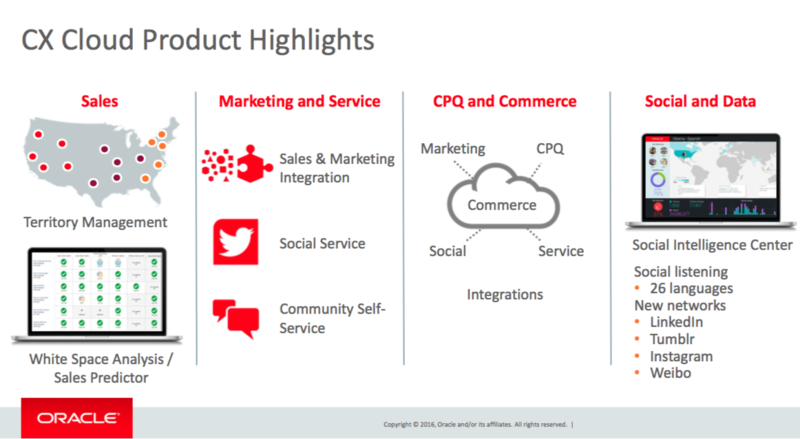 One of the TRENDS at #oraclecloud is to have all data in one place, analyzed to help brands to deliver the right message, at the right & real time, which results in much better customer experiences #cx for the customer and better business results for the brand. 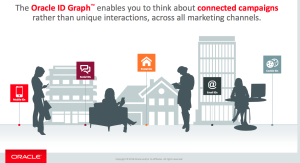 The message is that Oracle ID Graph can be used to connect customer behavior to get right message, to the right channel via modeling the data to discover the best decisions. 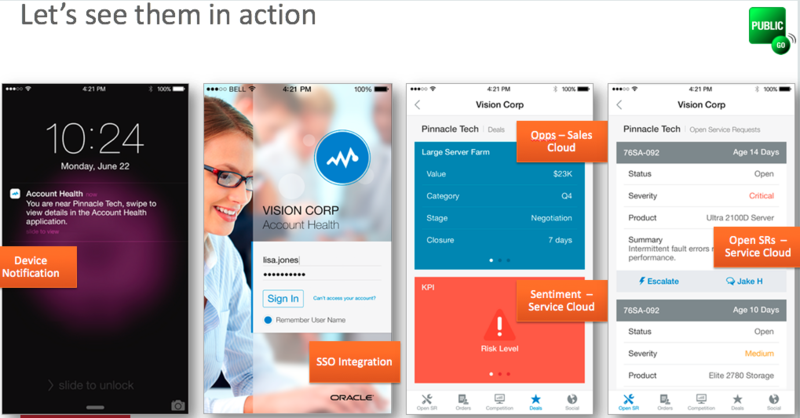 From analyzing all this data, Oracle has found the best predictor of future purchases is past purchases. This shows that one of the real values of data is customer’s behavior. 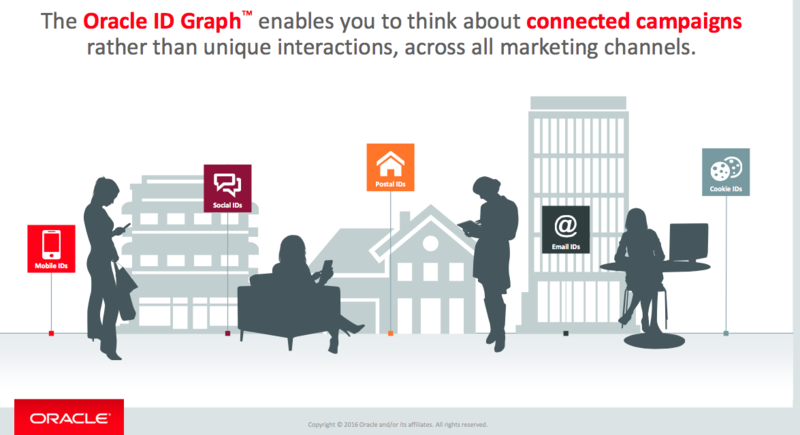 If businesses can understand “Say, Do, Buy” they will be able to target, personalize and measure the success of the customer experience across devices and channels via this Identity Graph. 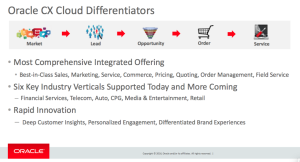 Oracle CX Cloud Differentiators: The CX Cloud Product Highlights include, because of the PaaS, DaaS, IaaS and SaaS, a unique customer experience cloud – including the ability to integrate the sales, marketing, service, commerce, social, mobile….to provide brands the ability to make the right business decisions, quickly. 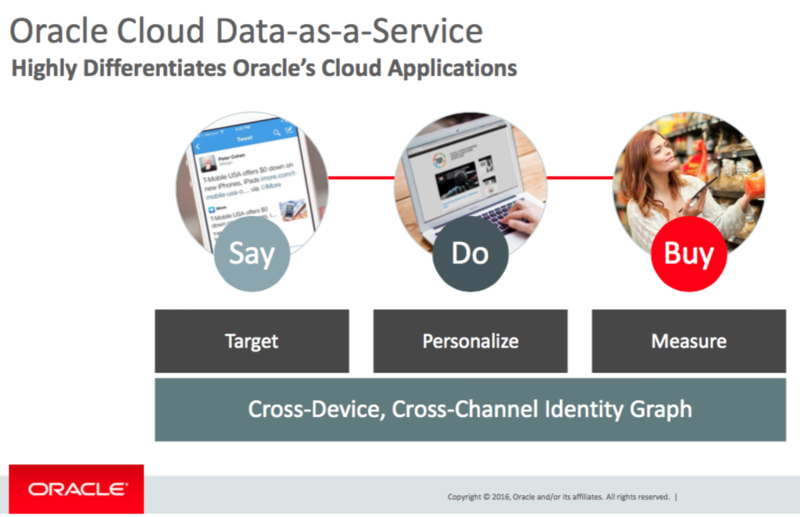 Future of B2C and B2B: If #oraclecloud could measure TV ads, it could put end to guessing how much money and where to spend money on TV ads. This is a huge challenge that needs to be solved. That would be a service that would put an end to the huge amounts of money that lead to the famous quote – “Half the money I spend on advertising is wasted; the trouble is I don’t know which half.” by John Wannamaker. 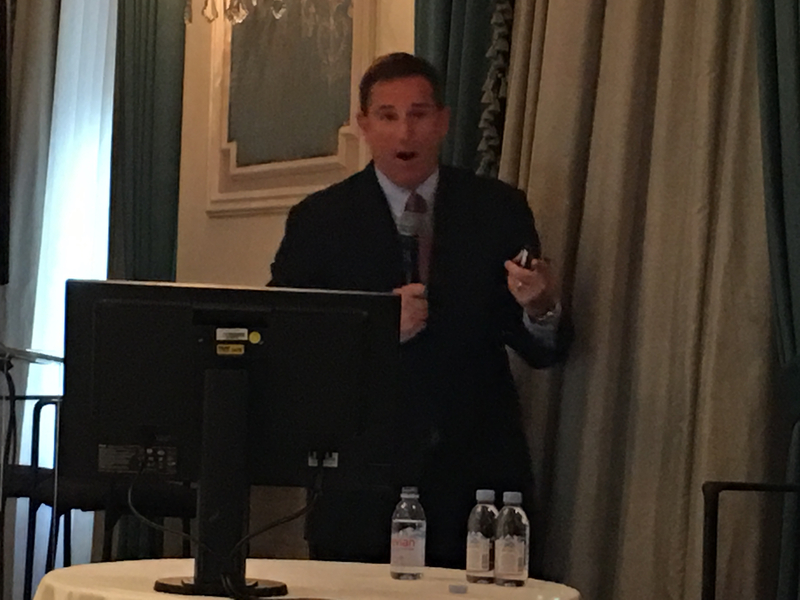 Mark Hurd @MarkVHurd: He’s speaking to us about their need to shift to persona selling, which they are and have done. It used to be that the buyer was the CIO. 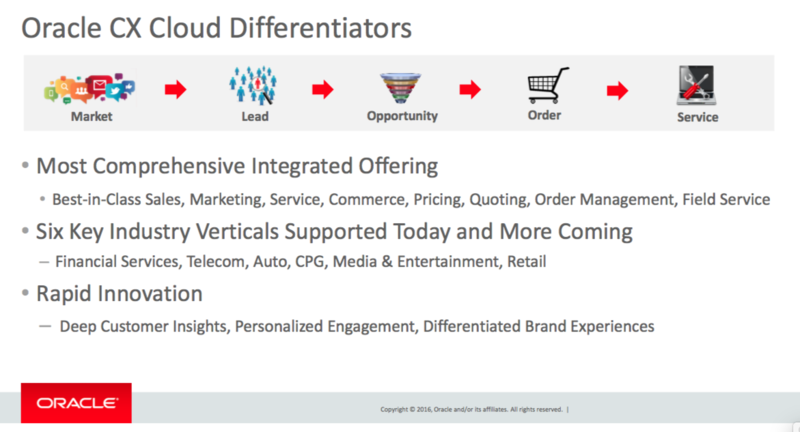 But the cloud has brought new buyers to the table – CMO’s, Customer Experience Professionals, Customer Service… Smart. The line of business doesn’t have to wait in line for IT’s list of to do’s. Maybe IT still needs to stay focused on their list. Certainly much of what they do is needed. And maybe it was never realistic to think they could do all that is required in IT and to service the lines of business. Perhaps that is part of the beauty of the cloud. It puts the line of business in charge of their needs in software / hardware. Mark is also talking to us about the idea that the focus of software as a service is interested in the business outcome, rather than what software companies used to focus on, which was the product. This is something that is so important. Software / Hardware for the sake of software / hardware is not enough, at least in my opinion. Until the cloud, the multiple customer personas didn’t have as much buying power and they didn’t have the weight they do now. Yes, hardware / software all needs to work, be secure, be fast, etc.. but at the end of the day, it has to provide a business owner capabilities that make their business run better. Period. Capgemini and onio: Capgemini announced the acquisition of oinio, one of Europe’s leading Salesforce partners. This acquisition will expand Capgemini’s Digital Strategy Group growth by augmenting Capgemini’s capabilities in providing digital transformation services around the Salesforce solutions and platform across Europe and Asia. Oinio, based in Munich, has become one of the major European players in the consulting and deployment of Salesforce cloud-based CRM and digital marketing solutions. Oonia has more than 600 projects for a portfolio of international clients in life sciences, manufacturing, financial services, high tech and utilities. What Does This Mean? What I find interesting about this acquisition is the pace at which the foreign markets are understanding the value of digital transformation. This type of acquisition clearly shows that both Capgemini and oinio are seeing the desire and need for consulting services in the digital transformation area. System integrators of yesteryear were known for implementing large, on-premise solutions, taking years to implement, many of which were given up on. Today, system integrators have had to reinvent themselves as the advent of SaaS / cloud solutions replacing the on-premise projects. But smart systems integrators have become trusted advisors in the role of aiding digital transformation. Because there is so much about a business that has to be transformed, in reality there is a huge market for systems integrators that realize that the transition from the old way of doing business, to truly being digital requires a transformation of people, process, leadership and technology. And there is no shortage of actual work that has to get done to make that all happen. The future? 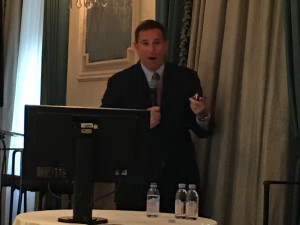 Look to see which systems integrators are understanding what digital transformation means and who is leading companies to transform their culture, the mindset, their leadership, their workforce, their processes (how work gets done and how customers are interacted with and engaged) and what technologies are chosen to make this a reality in the short term. The longer companies wait to take on this type of endeavor, the more danger they put themselves in becoming extinct, i.e., irrelevant to their customers and unfortunately, for some really great brands, the certainty of going out of business. IBM and Genesys (www.genesys.com), a leading provider of customer experience and contact center solutions, today announced a partnership that will transform how organizations of all sizes differentiate their customer experience by tapping the power of IBM Watson to transform the way brands engage clients across customer service, marketing and sales through data-driven insights and automated actions. The combination of the Watson Engagement Advisor with the Genesys Customer Experience Platform to is reportedly positioned to transform how organizations worldwide engage with their customers across customer experience touchpoints and channels of communication. This partnerships will allow Genesys to develop a learning system that can better serve consumers in their self-service applications and contact centers because The Watson Engagement Advisor enables natural language solution learning and adapts and understands market and organizational data quickly and easily, and gets progressively smarter with use, outcomes, and new pieces of information. WHAT IS A SPECIFIC EXAMPLE OF HOW THE WATSON ENGAGEMENT ADVISOR HELPS CUSTOMER SERVICE AGENTS? The partnership will aid and assist a brand’s customer service agents to provide fast, data-driven answers, or simply sit directly in the hands of consumers via mobile device, chat session or online interaction. In one simple click, the solution’s “Ask Watson” feature can quickly help address customers’ questions, offer feedback to guide their purchase decisions, and troubleshoot their problems. Because today’s consumers are a tweet, post, phone call, email or web chat away from reporting an issue or asking a question, and nearly half expect a response from businesses within a span of minutes, according to Edison Research, companies need to get a lot smarter about how they operationalize real-time customer service. Brand customer representatives who field these inquiries are often backlogged with time-consuming issues or questions that require detailed, accurate responses not often readily available to them – which can lead to an inconsistent customer experience. We’ve all been there – called a contact center and knew more about what we were asking than the company did. Perhaps this will help agents become closer to being able to provide real-time customer service. DOES THIS MEAN KNOWLEDGE MANAGEMENT DATABASES ARE BEING REINVENTED? Contact center agents can gain access to a cloud-based Watson advisor that reads and uncover insights from millions of pages of data-driven content within seconds, from product guides to call transcripts. The result: cognitive computing that will augment a contact center agent’s knowledge and shift their time from searching for answers to discovering timely insights that solve problems, facilitate new opportunities, and improve the customer experience. WHAT IS A SPECIFIC EXAMPLE OF HOW THE WATSON ENGAGEMENT ADVISOR HELPS CUSTOMERS? Genesys customers will gain the additional value of a Watson cloud-based advisor that thinks, learns and provides expert insights, while combing through millions of pages of data within seconds for customers and the contact center agents who serve them. As a result, Genesys customers can tap into the body of data that Watson understands and puts to work and use that knowledge to deliver more actionable and satisfying responses to customer inquiries in their self-service applications and contact centers. HOW DOES THIS CONNECT A CUSTOMER AND A COMPANY TO PROVIDE BETTER SERVICE? Imagine yourself as a bank customer, home from work and doing late night research on mortgage loans after your children are in bed. You may see a feature or rate that you like, but you have detailed questions that require expert advice. You can call, email or tweet the brand, but it’s after-hours. Many brands dont even pay attention to tweets much less have someone answering questions at night. Often that customer would not have access to a customer service agent until the next day. Now envision the following experience: at any time of night, you can access a web chat advisor that has access to the bank’s data-driven content around mortgages, and through a natural language interface, understands your questions and history interacting with the bank. Not only will the application educate you on all things mortgage shopping, but it will also provide a formal offer that can be presented by a mortgage expert at a convenient time scheduled by you. WHAT INDUSTRIES DOES THIS SOLUTION PROVIDE BETTER SERVICE FOR? 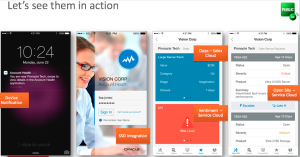 Leveraging its experience and deep domain expertise across industries including banking, insurance, and retail, Genesys will integrate access to the cloud-based Watson to its Customer Experience Platform empowering their customers with the ability to interact through a natural dialog leveraging Watson’s understanding and intelligent natural language response. Now consumers can tap into Watson to gain insight and answers faster than possible with knowledge management solutions. HOW WILL THIS IBM AND GENESYS PARTNERSHIP AFFECT SELF-SERVICE? The desire for self-service is there – both from the company’s point of view (reduce call volume, etc…) and customers are tired of calling into a contact center only to be disappointed. But while self-service has been a leading “idea” it rarely delivers an experience that doesn’t garner the customer to try to get help in another channel, often the phone channel. This defeats the purpose of self-service and reduces the first contact resolution — one of the most important indicators of customer satisfaction and loyalty. The IBM Watson and Genesys solution provides organizations with the ability to identify when a customer needs to speak with a customer experience representative, rather than continuing in a self-service application. For example, if a customer reaches a point in conversation during a self-service interaction that could prompt either customer churn or a timely sales opportunity, Watson’s knowledge of pre-defined business guidelines allows the solution to signal when it is time to transfer the conversation to an agent. The customer is not arbitrarily transferred to just any agent among the potentially hundreds who work at a call center. The solution pinpoints the exact agent to handle a customer’s inquiry, based on specific factors such as an agent’s experience, channel used, training and even license to discuss or sell a given product and then transfers the customer with the accompanying detail of the self-service interaction. This could mean a shift to reducing call volume and increasing first contact resolution – if it works as indicated. Case studies will be interesting to hear how brands are actually putting it to use. WHAT DOES THE CEO OF GENESYS THINK ABOUT THE NEW PARTNERSHIP? WHAT DOES THE MIKE RHODIN, SVP OF IBM WATSON GROUP THINK ABOUT THE NEW PARTNERSHIP? 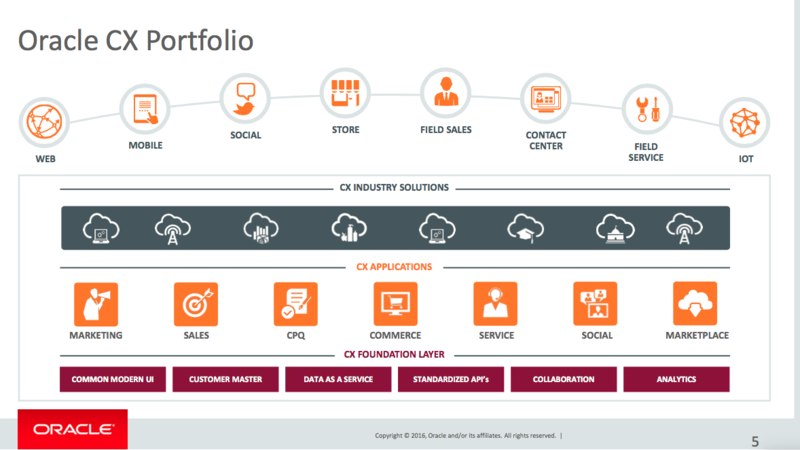 Genesys is the market leader in multi-channel customer experience (CX) and contact center solutions in the cloud and on-premises. We help brands of all sizes make great CX great business. The Genesys Customer Experience Platform powers optimal customer journeys consistently across all touchpoints, channels and interactions to turn customers into brand advocates. Genesys is trusted by over 4,500 customers in 80 countries to orchestrate more than 100 million digital and voice interactions each day. Visit us at www.genesys.com or call us at +1.888.436.3797. Three years after its victory on the TV quiz show Jeopardy!, IBM Watson has evolved to represent a new era of computing, where by 2017 it is predicted that 10 percent of computers will be able to learn as Watson does. Today, Watson is no longer just the world’s most famous game-playing computer. IBM has put Watson to work in various industries. In healthcare, IBM is co-developing an application with Memorial Sloan-Kettering Cancer Center, and partnering with WellPoint, the University of Texas MD Anderson Cancer Center, and the Cleveland Clinic Lerner College of Medicine. Additionally, IBM has partnered with numerous colleges and universities across the country to teach Watson capabilities and cognitive computing technology to the next generation workforce. In 2013, IBM announced the introduction of the IBM Watson Engagement Advisor, the first Watson offering designed to improve customer experience, putting the power of Watson within reach of everyone. IBM’s mission to spark a new generation of Watson-powered apps is just the latest milestone in developing cognitive system offerings that help its clients and partners succeed. LiveOps® Engage™ is the industry’s first single, integrated, multichannel desktop, built with both the agent and the customer in mind. LiveOps Engage simplifies the user experience to increase agent productivity and improve customer experience across all channels on a single screen: phone, email, live chat, SMS, Twitter, and Facebook. Inspired by modern web design, LiveOps Engage is a browser-based cloud application that’s available at no additional cost to customers of the LiveOps Platform. The contemporary design, color palettes and typography of LiveOps Engage create a highly intuitive user interface that’s easy to learn and use. Agents using LiveOps Engage need less time and fewer clicks to complete the most common functions, since everything is contained in a single, integrated agent desktop. Industry experts estimate that the time delays created for agents by disconnected applications can cost companies more than $5,000 per year in unnecessary spend per agent. These delays also lead to inconsistent service across communications channels and ultimately a fragmented brand experience for the consumer. Contact center agents are critical brand ambassadors, but they are often not empowered with the right tools they need to effectively manage their work flow or track customer engagement across an increasing number of channels. Whether the customer initiates a phone call, email, chat session, SMS, Facebook post or Tweet, the message and phone panels in LiveOps Engage are integrated within a single screen. This single screen integration enables agents to receive a 360 degree view of the customer to ensure that the most relevant information is seen at the right time alongside a history of past interaction. Plus, the integrated user interface of LiveOps Engage helps agents to quickly and easily respond to customers in the channel the customer prefers, or seamlessly pivot to the channel best suited to resolve the customer’s issue. This empowers agents to resolve customer inquiries faster and with greater accuracy, and can improve customer satisfaction. As a company with more than 10 years of experience running the world’s largest cloud customer service contact center, LiveOps knows how agents work and how their performances are measured. This unparalleled expertise has shaped the vision at LiveOps that the future of customer service hinges on brands not only having a complete view of their customer and their interaction history in one place, but also the ability to pivot customer interactions across multiple channels in one application. LiveOps is the global leader in cloud contact center and customer service solutions. 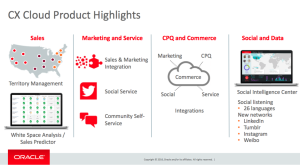 More than 300 companies around the world, including Salesforce.com, Symantec, Royal Mail Group, and Amway New Zealand trust LiveOps’ technology to enable effective multichannel, social and mobile interactions with their customers. LiveOps’ award-winning platform has processed more than 1 Billion minutes of customer interactions and managed operations for the largest US-based cloud contact center of 20,000 home-based, independent agents. With 10+ years of cloud experience LiveOps is the partner of choice for companies wanting to migrate to the cloud. Headquartered in Redwood City, California with European regional headquarters in London, UK, LiveOps supports a wide range of industries including financial, health care, insurance, retail, and high tech. For more information visit www.LiveOps.com.